This week marks the first anniversary of the passing of my friend, Marion Cunningham, an icon and champion – like her mentor, James Beard – of American home cooking. 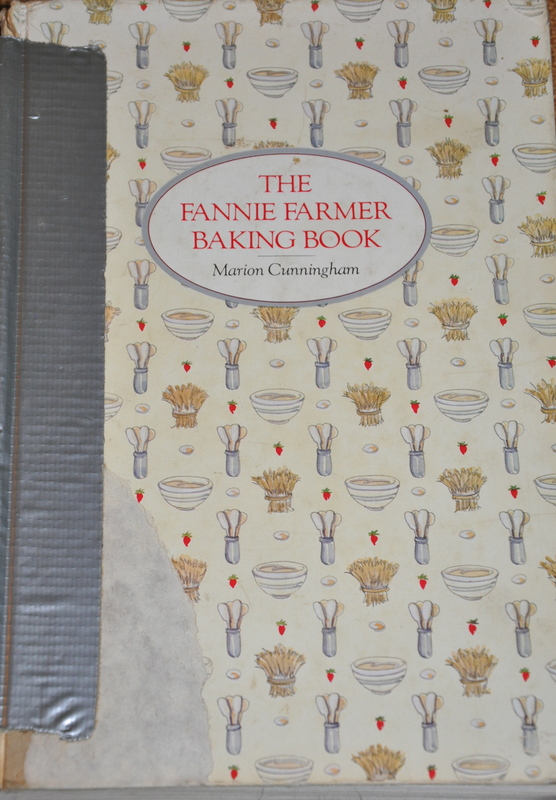 If you’re less than familiar with her body of work, it was Marion who was handpicked by Judith Jones, Beard’s friend and editor, to overhaul and rewrite The Fannie Farmer Cookbook and to write The Fannie Farmer Baking Book. 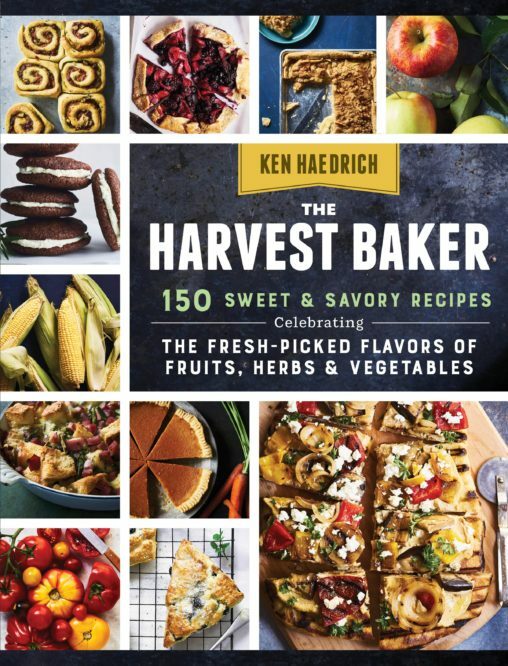 Many other books followed in her own name, each the embodiment of good taste, restraint, practicality, and the sheer joy of being in the kitchen. I first met Marion in the late 1980’s. 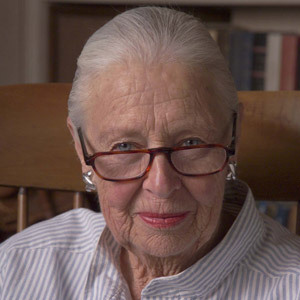 To me – and to a legion of other young food writers and chefs – she was something of a mother figure, someone to whom you could turn for advice and a dose of good sense. No matter how busy she was, she always seemed to have time to answer my questions, talk about baking and meal making, and offer an opinion about pots, pans, and cooking tools. Marion loved a good story, and I’ll never forget one she related during one of our Sunday phone chats – she at home in Walnut Creek, California and I in rural New Hampshire. 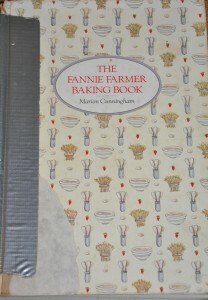 A gentleman, who had tracked her down from the phone book, had recently called and wanted some baking advice. He was a bachelor, and ate out more often than he felt he should. If he could just learn to master some recipes and cook for himself, he told her, perhaps he’d be better off. Later in the 90’s, Marion paid me a visit at my home in New Hampshire, making a special trip up from Boston where she’d traveled to do a series of cooking classes. I was a little apprehensive about her visit. After all, I was a struggling writer at the time and – like many struggling writers – I lived modestly. My home was an old hunting cabin on the edge of the White Mountains. It was about as airtight and energy efficient as a sieve. The roof often leaked. We had a ground well, which often ran dry in the summer, and an outhouse for those occasions when it did. It didn’t help matters that I kept replaying my mom and dad’s first visit to my rural home in my head. Me: Well, how do you like it, dad? Has a lot of charm, doesn’t it? Dad, after a considerable pause: I’ll give you this – it’s got a lot of trees. Long story short, Marion was perfectly charmed and gracious. We had a wonderful time, she spent the night, and before leaving the next day we chatted for hours over baked goods and coffee. I’ll never forget that, and she was kind enough to write about her visit in the foreword to my then soon-to-be-released Maple Syrup Cookbook. As the years went by, we talked less frequently. I got busy raising a family. And we both faced the constant demands of cookbook deadlines and cooking events. But I’ll always cherish her friendship and give thanks for having been one of her friends. 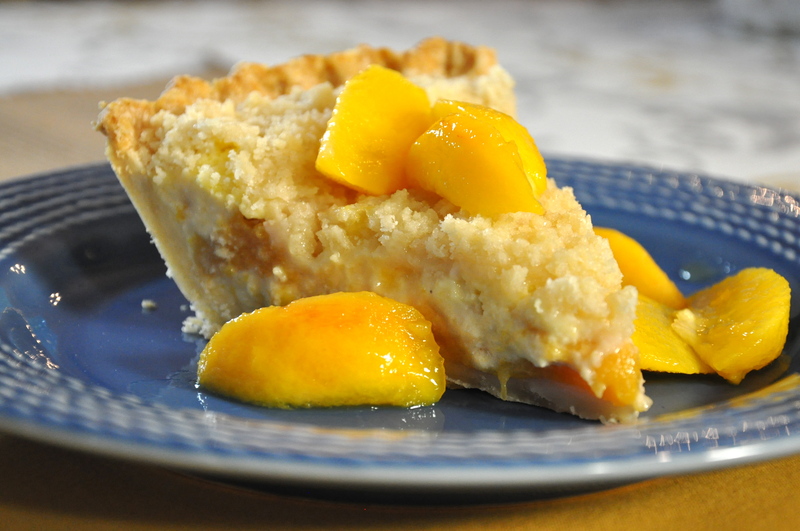 And Now, How About Some Peach Custard Pie? We’re still in the grip of peach season here in the Lowcountry, though I promise next week we’ll set off in a very promising new direction. But I couldn’t let the season pass without tipping you off to a pie that marries a trio of my favorite things: ripe peaches, rich custard, and a crumb topping. It’s something of a hybrid pie, and one you should try to finish off completely the day after you make it because the longer it sits the weepier it gets as the peach juices become increasingly unstable. 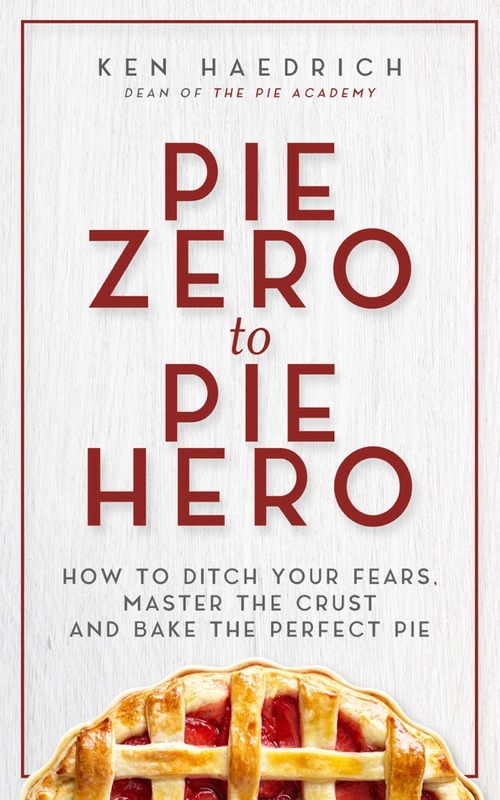 I often get emails from pie makers who want to know if they really do have to prebake their pie shell. And even though my answer is always the same – yes, you do, when I say you do – I will occasionally not prebake the shell even when I know better, just to make sure I’m not being unreasonable or copping a snobbish attitude about the whole prebaking thing. 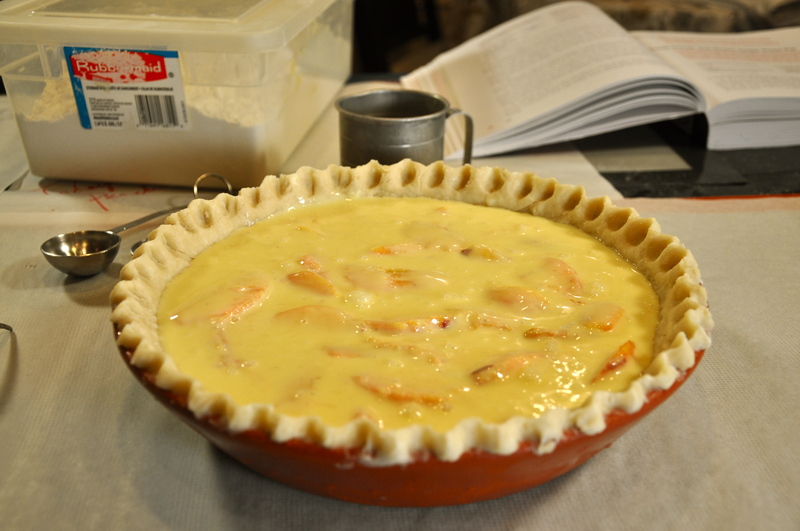 The pie shell is covered with a thick layer of ripe peaches; over that, you pour a sour cream custard, after which your main job in life becomes making sure the custard is coddled and cajoled to the point where it is perfectly baked without overbaking it. That’s a little challenging because custards, in general, like low, slow, even cooking and yours is exposed to the heat of the oven on top, but underneath it has a thick buffer of pastry and peaches. As such, it gets a little confused about your wishes to see it bake flawlessly. If you follow my times and temperatures pretty carefully, you should do fine. 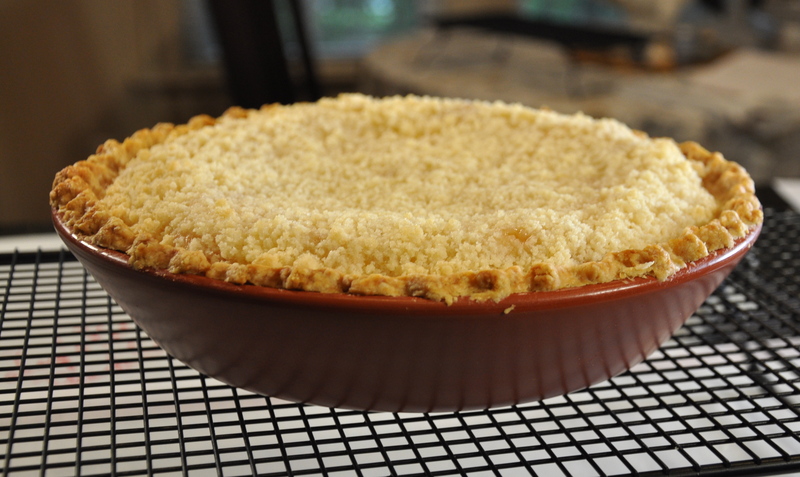 The top of the custard gets a little reprieve at the 25 minute mark, when you add the crumb topping: the topping itself cushions and protects the custard and buys enough time for the entire thing to cook up perfectly from within. Just keep a close eye on the pie, without opening the oven door if possible; constant door opening really confuses your pies. A little puffing is expected, but if the filling starts to puff up quickly around the edges, lower the heat. Generally speaking, you can rarely damage a custard by cooking it too slowly. But you can mess it up good – and make it curdle – if you bake it too fast. The flour in the custard does help to stabilize it, but it won’t protect it from the worst of your sins. Once the topping goes on, it may or may not turn a little golden brown, depending on how much longer your pie bakes. It’s nice if it does, since it adds visual interest, but don’t use the color of your topping to gauge doneness: that’s determined by the overall movement of the filling, which should more or less jiggle as a whole. It should not seem at all soupy or loose in the middle. The pie is cooled, then refrigerated overnight so the filling tightens up to the proper texture. 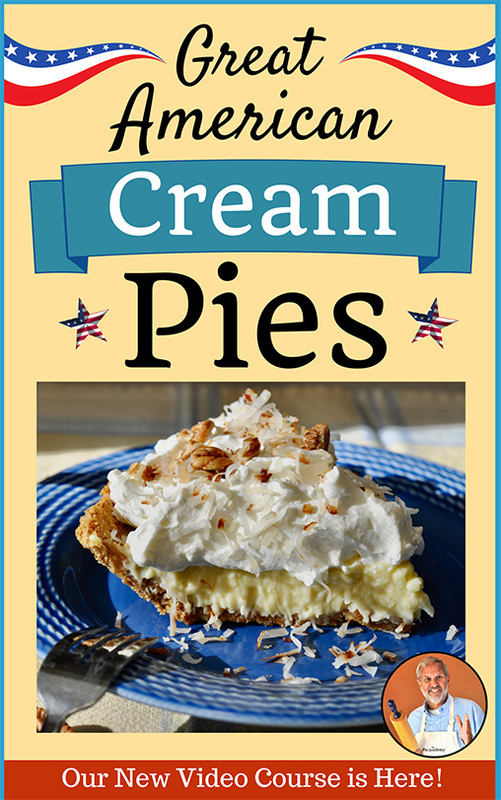 Don’t cover the pie when you put it in the fridge because any moisture buildup will ruin the nice crunch in your topping. 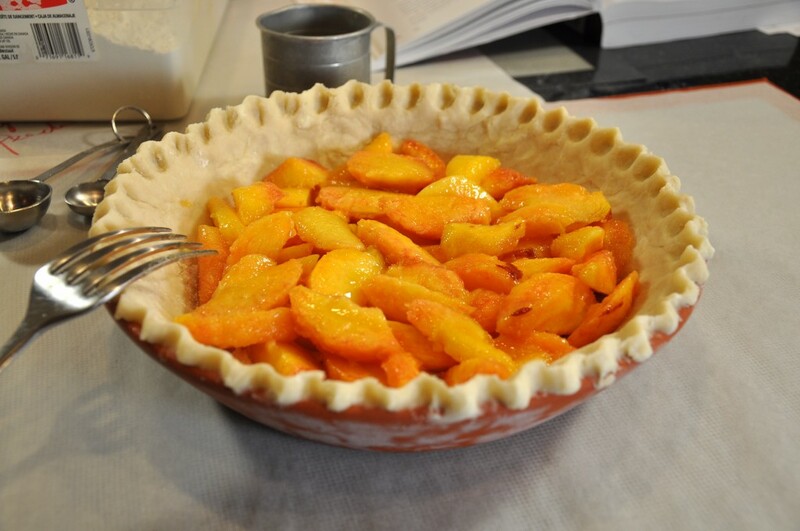 This pie is somewhat lacking in color, which is why I like to garnish it with sliced peaches. Have some friends over, slice the entire thing up, and deliver pieces to the neighbors, who will likely be shocked to see you at the door holding a slab of pie. But like I said, do try to eat the whole thing while it’s in its prime. It doesn’t freeze well, so forget that option too. 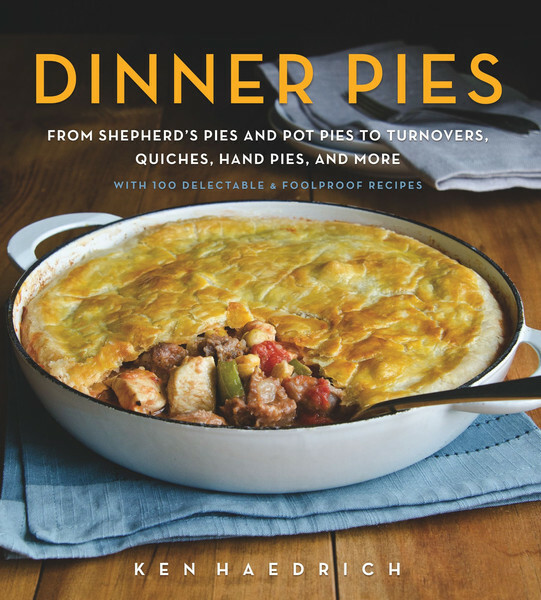 PASTRY NOTE: Use either the FOOD PROCESSOR PIE DOUGH or the GOOD BASIC PIE DOUGH for this pie. On a sheet of lightly floured wax paper, roll the pastry into a 13" - 13 1/2" circle. Invert the pastry over a 9 1/2" deep-dish pie pan, center, and peel off the paper. Gently tuck the pastry into the pan, without stretching it, then pinch the edge into an upstanding rim. Crimp or flute, if desired. Place in the freezer for 15 minutes while you preheat the oven to 400°. Set the oven to 400°. Whisk the sugar, 3 tablespoons flour, and nutmeg in a large mixing bowl. Add the sour cream, heavy cream, egg yolks, and vanilla. Whisk again, until evenly blended. Set aside. 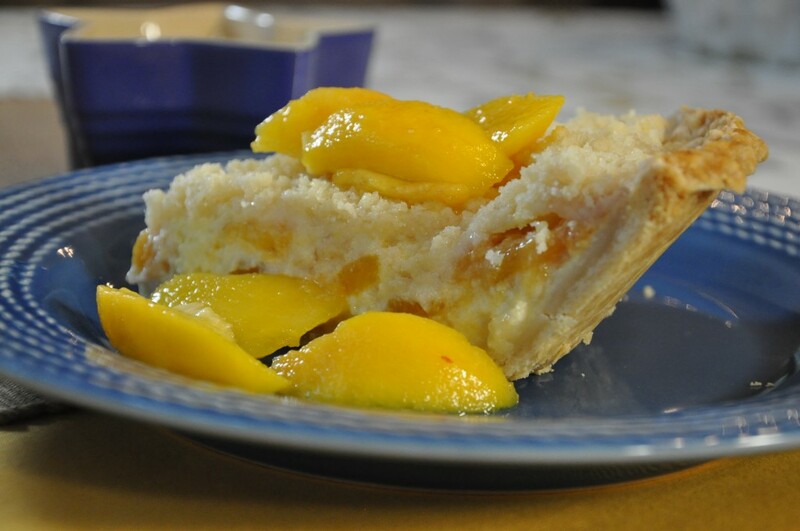 Arrange the sliced peaches in one even layer in your pie shell. Slowly pour the custard over the top. Using a fork, gently nudge the peaches so the custard settles around them. Put the pie on the center oven rack and bake for 15 minutes. After 15 minutes, turn the heat down to 350° and bake 10 minutes longer. During this initial baking period, make the topping. Combine the flour and sugar in a large bowl. Add the butter and cut or rub it into the dry ingredients until you have sandy, buttery crumbs. Refrigerate. 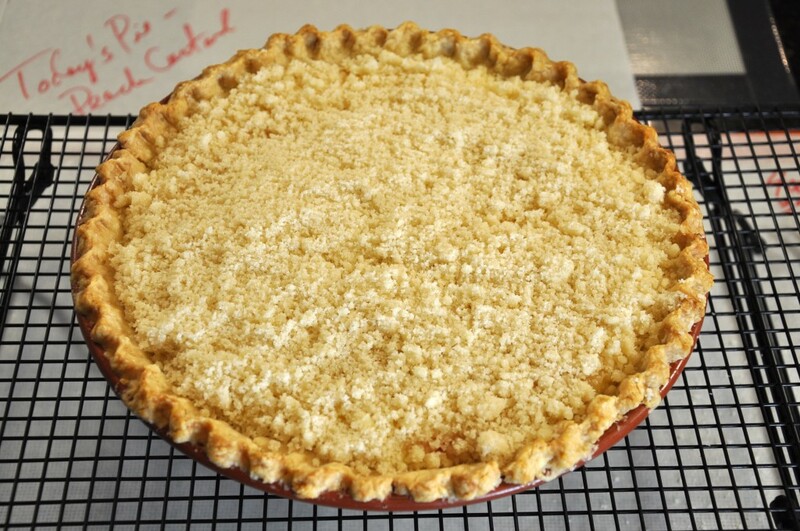 After the pie has baked for 25 minutes - the initial 15 minutes plus the 10 minutes at 350° - slide the pie out and spread the crumb topping evenly over the custard. Slide the pie back in, reduce the heat to 325°, and bake another 25 to 30 minutes. 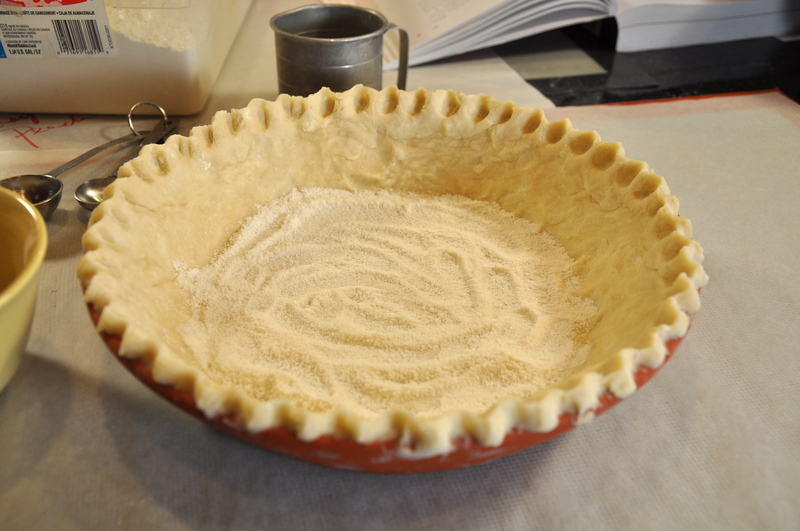 When the pie is done, it will jiggle as a whole and the filling won't seem loose or soupy in the center. If it seems to need a little more time, that's fine. When it's done, turn off the oven, slide the shelf out a little, and let the pie cool like this for about 10 minutes. Transfer to a cooling rack. Cool thoroughly on the rack, then put the pie in the fridge - uncovered - for at least 8 hours, preferably a little longer, before serving. Serves 8 to 10.